they are never used; the vines cover the doors. but had no time to finish it. Grisaille in Lexington Grey and brunaille in DeAtramentis Document Brown and Super5 Australia created the under-painting. 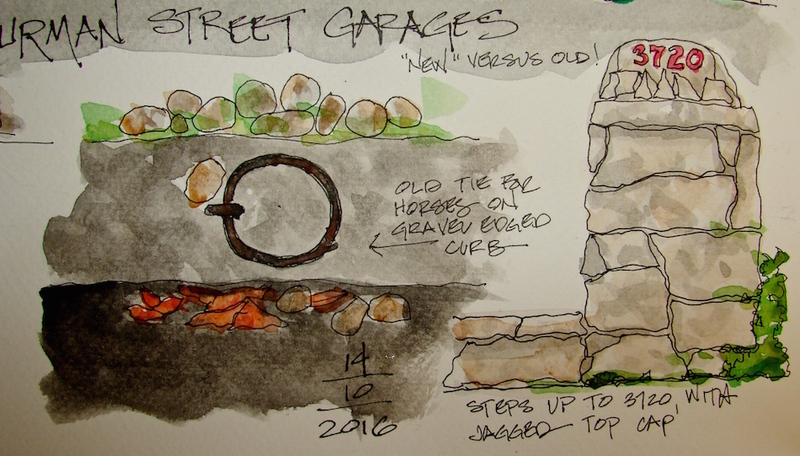 Yes, iron rings for horse ties still line the streets. And a bit of a wicked looking address marker! I am playing in the group Thursday Doors, led by Norm 2.0, with others, here! Have you got a door in your sketchbook? Sennelier, Holbein, M.Graham, Greenleaf & Blueberry, and Daniel Smith watercolors. 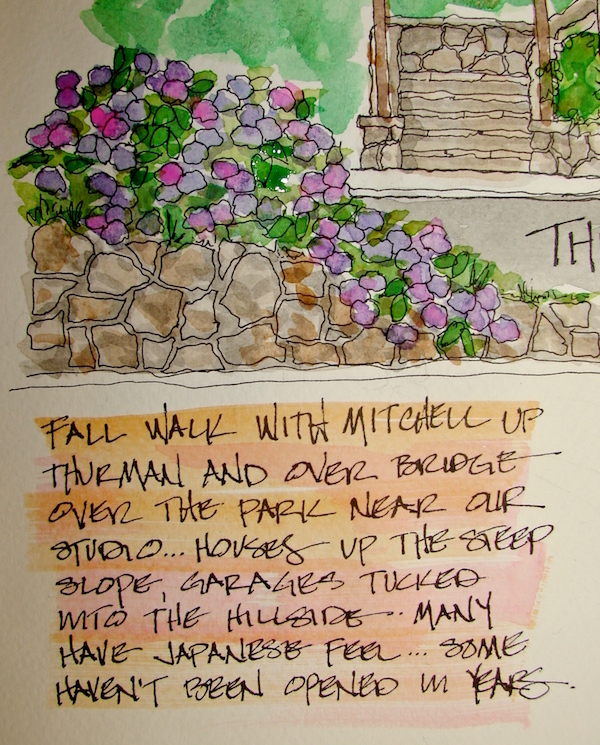 This entry was posted in architecture, art journal, drawing, journal, memory, pen & ink, process, sketchbook, urban sketchers, watercolor and tagged architecture, art journal, brunaille, Daniel Smith watercolors, De Atramentis Document ink, Fabriano Watercolor journal, grisaille underpainting, Lamy Al-Star, NW Portland, Platinum Carbon pen, Portland Oregon, Sennelier, Super5 ink, Thurman St, urban sketchers, USk, virtual sketchwalk, watercolor. Bookmark the permalink. 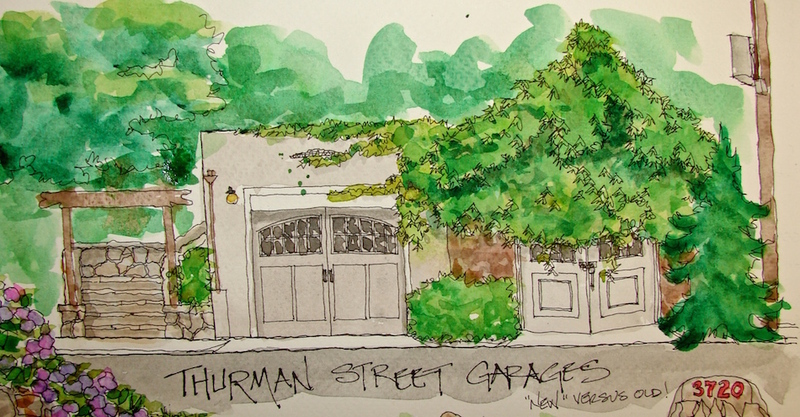 I love the painting and middle garage door. When we replace our garage door I want to replace it with some with more interest than the boring one we have now. 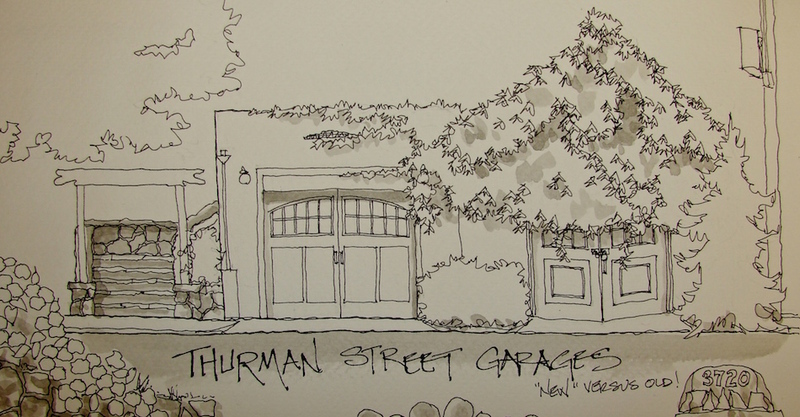 We have some amazing garages on this street! 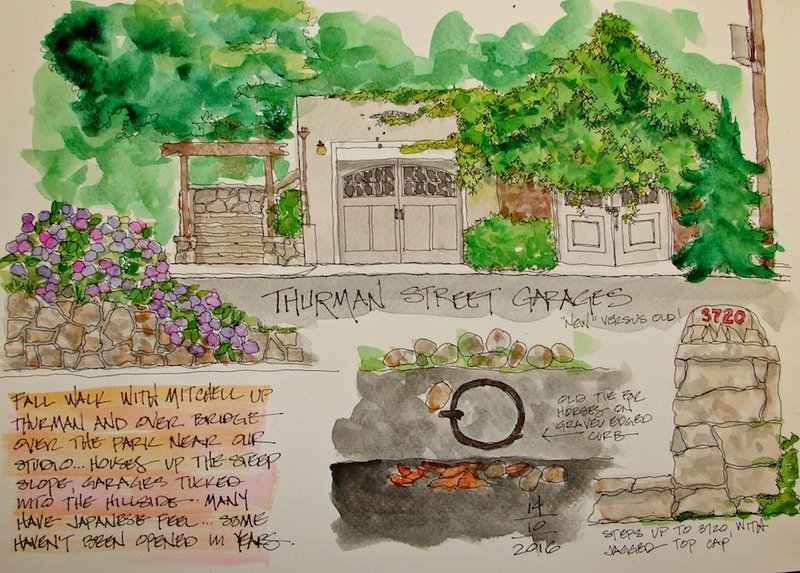 I love the combo of the garage doors and their rich foliage with the small architectural details! What a lovely snapshot of the personality of this place. Thank you! The street is full of these types of places. 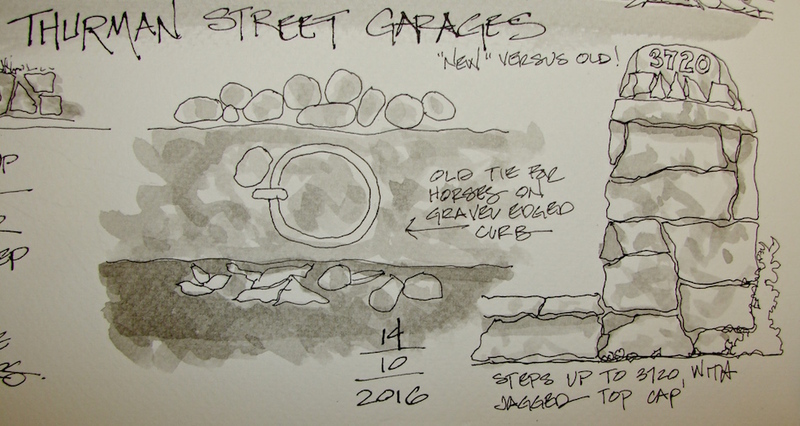 I’m wondering if any of those older garages are actually in use for cars. It seems that despite the fact that cars were bigger than they are now, older residential garages were much smaller…at least a lot of the ones I’ve seen anyway. In Portland we have a lot of tiny cars being driven, and I have seen some of the older garages in use again. There is one I want to get a picture of but the traffic is horrendous! I really like that garage door, Kate. I like that you share the rogk in progress. It’s fascinating to see how you get to the finsihed state. Of course I was on my phone, Kate. I’m going to toss that thing. I typed ‘work’ (I probably missed a key) which it turned into ‘world’ – I started over and really tried to get ‘work’- How it came up with ROGK ??? At least it was good for a laugh, and irritable body parts weren’t involved. Can always figure on phones! I love the horse ties and all the greenery. I love those little details too! 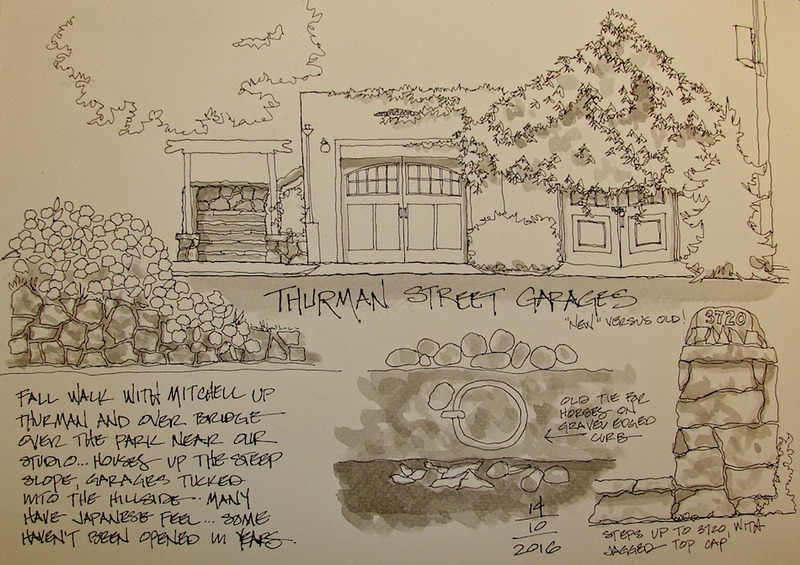 Great sketches! Almost like a designer’s rendering. really beautiful art Kate, I admire your sketch style. Happy PPF! Beautiful sketches? I love all of the tiny details & descriptions too. Thanks for the link to Thursday Doors. Sounds like fun. Thanks Terri! It is a fun group, and many of the bloggers have interesting blogs on a normal basis. Open to all artists too!